It looks like the Korean automaker has finally decided to work a bit over its designing. 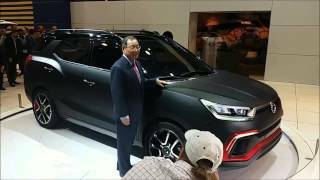 The presumption isn’t just birth of rumors but it is result of the recent unveil that the SsangYong officials made at the Frankfurt Motor Show 2015 with the SsangYong XAV Adventure Concept 2015 off-road concept. Working over All-wheel-drive mechanism the electric off-road model is speculated to take some better space in market. Let us have a look at the review of SsangYong XAV Adventure Concept 2015 to know more about it. The interior of SsangYong XAV Adventure Concept 2015 didn’t receive an entire overhaul but yes the integrated upgrades are definitely worth a try. The similar looking three-spoke steering wheel and the center console are the first that might grab your attention followed by the infotainment controls and the climate knobs. Plastic Y has been vastly used in creating the interior, however I consider this to be better than the hard plastic that we had in the predecessor models from the house. Though we do not have sufficient details about the interior but looking at the redesigning done at the exterior (we’ll be talking about it in next heading) we presume the interior of SsangYong XAV Adventure Concept 2015 to be worth the pennies. The exterior of SsangYong XAV Adventure Concept 2015 is that particular portion that will steal the gleam. I won’t say it is stunning but yes better than predecessors and the few of the rest in same segment. The exterior design infact is quite similar to the Jeep’s Trailhawk 2007; this means you have sportive off-road vehicle waiting for you. The front end is extremely aggressive with those tiger-eyed headlights sitting at both the corners of the traditional angry-faced grille. There is a vast air vent in the lower portion that adds to the aggression of front fascia. Rear view mirrors too get redesign with distinct holding bars, which I believe I never noticed in any model. The massive wheels rolling this entire setup add impeccably to the glory. 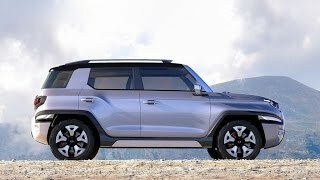 Thus rounding up the exterior details of SsangYong XAV Adventure Concept 2015 all I can say is, ‘I expect this particular model to get some hike in its sell’. The SsangYong XAV Adventure Concept 2015 comes with two engine choices; first one is 1.6 liter petrol while the second is 1.6 liter gasoline. The model uses a hybrid powertrain and comes loaded with a 13 hp front motor and generator or a 40 hp dual rear wheel motors attached to a lithium ion battery. The performance figures of SsangYong XAV Adventure Concept 2015 are not yet shared but we assure you to bring them at your doorsteps as soon as the officials share them.